History: (What If? I#8 (fb)) - Peter Parker was bitten by a radioactive spider, giving him superpowers which he used to become the hero Spider-Man. (What If? I#8 (fb)) - Having trained his body to physical perfection, Matt Murdock leapt in front of a truck to save a bystander. The truck splashed radioactive materials into Murdock's face, blinding him but increasing his other senses to superhuman sensitivity. (What If? I#8) - During a battle between Daredevil and Electro at the Fantastic Four's Baxter Building, Spider-Man intervened as he was on the run from a robot created by J. Jonah Jameson. Electro soon tried to electrocute Daredevil, who easily dodged and teamed with Spider-Man to take down Electro, but not before Electro deduced that Daredevil was blind due to his not being blinded by Electro's electric blast and DD's inability to voice the color of Electro's costume. After Electro was arrested, Electro revealed to the press Daredevil's handicap. Not long after, the criminal Owl went to the offices to force Matt Murdock to be his lawyer and while there, Daredevil arrived through the window. Knowing Daredevil's weakness, the Owl set up a device that generated extremely loud owl hooting and smells to throw off Daredevil's enhanced senses. Daredevil soon managed to hit the police alarm with his billy club, forcing the Owl to retreat or risk proof of his criminal activities. While making sure that Karen Page was ok, Daredevil learned that Karen had deduced his true identity and he kissed her just as Foggy Nelson arrived with the police. Soon after, Karen began trying to talk Matt Murdock into going to see Dr. Van Eyck about his treatments for blindness as Foggy began nursing a jealousy over Daredevil's love for Karen Page, having witnessed their kiss. Matt eventually decided to see Dr. Van Eyck in Lichtenbad where his former classmate and current hereditary ruler of Lichtenbad, Duke Klaus Kruger, led Matt and Karen to the doctor. Despite wanting to discover why the people of Lichtenbad hated the Duke so badly, Karen talked Matt into going through with the experimental surgery from Dr. Van Eyck to restore his sight. Once the surgery was completed, the doctor admitted that he hoped that Matt and Karen could somehow notify the United States embassy of the Duke's tyranny. The doctor was quickly taken away for his "treason" and Matt decided to suit up as Daredevil despite his recent surgery in order to save the doctor. Daredevil soon defeated the Duke as Dr. Van Eyck deduced the hero's true identity by the coincidence of having a blind hero in Lichtenbad at the same time as a blind lawyer. After the Duke set off a device that would cover the Earth in a radioactive cobalt cloud, Dr. Van Eyck tried to shut down the atomic pile himself. Daredevil quickly defeated the Duke and pushed the doctor out of the way of the radiation, taking a large dose of the radiation himself while shutting down the atomic pile. Later, as Matt Murdock recovered, he realized that Dr. Van Eyck's experiment procedure was a success, restoring Matt's vision. Immediately, Matt kissed Karen but then realized that his other senses were no longer superhumanly accurate due to the exposure to the radioactive pile. Matt and Karen then returned home to celebrate Matt's newfound sight. Weeks later, as Matt returned home to his apartment, he found thugs waiting for him who demanded that he come with them to defend someone in a trial. The thugs then took Matt to the headquarters of the Owl where Matt was told he was to defend Judge Lewis, the judge who had sentenced the Owl to prison. In order to save the Judge from the Owl's sentence of death, Matt demanded that he be allowed to call a witness. The Owl agreed to Matt's terms and moments later, Daredevil erupted into the mock courtroom. The Owl quickly made an escape as Daredevil followed. Upon confronting the Owl, Daredevil was met with the Owl's robotic owl. The robotic owl disrupted the Owl's headquarters, causing its volcanic foundations to erupt as Daredevil managed to save Judge Lewis after knocking the Owl unconscious. The robotic owl soon flew near Long Island, where it crashed, exploding due to the high-potency bomb inside it. While Daredevil managed to rescue Judge Lewis from the bomb, the Owl was not so lucky. Days later, Daredevil called a press conference where he publicy revealed his identity, feeling that Daredevil did not exist without his powers. He then announced that while he was giving up his superhero career, he was not giving up his war on crime, revealing that he planned on running for the office of district attorney. As Karen and Matt shared a hug, Foggy Nelson walked away, feeling that his chances with Karen Page and as a district attorney were now gone. He became teary-eyed and thought to himself that despite his former plans, he would always be in Matt and Karen's corner. Soon after, Matt and Karen were married and Matt won the election of district attorney in a landslide victory. Comments: Created by Don Glut, Alan Kupperberg, and Jim Mooney. And yes, I'm aware of the bad grammar in the title but that's how the issue's cover was worded: "What if the World Knew That Daredevil is Blind?" Perfect grammar! The word "knew" along with "is" in the same sentence! Great! This reality diverged during the events seen in Daredevil I#2, when Electro missed his chance to electrocute Daredevil. Daredevil was very similar to his Earth-616 counterpart up until he dodged being electrocuted by Electro during a battle between the two. 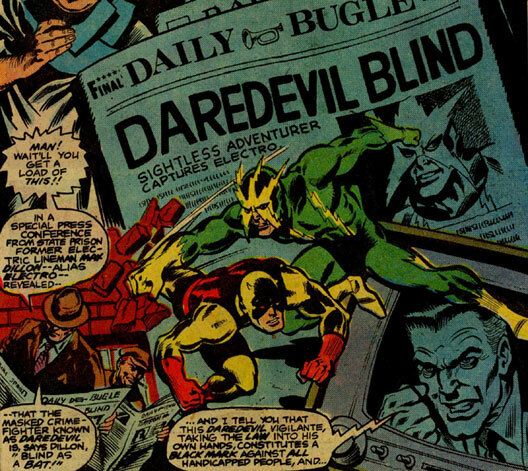 During the course of the battle, Electro discovered that Daredevil was blind and revealed the news to the press. Soon after, the Owl attacked Matt Murdock's law firm and was driven off but not before Karen Page realized Daredevil's true identity. She soon talked Matt Murdock into visiting Dr. Van Eyck to go through an experimental procedure that would restore his vision. His vision restored, Daredevil was soon called into action to save Dr. Van Eyck from Duke Klaus Kruger where he was exposed to radiation from one of Kruger's weapons. The radiation caused Daredevil to lose his heightened senses but with his vision restored, Matt remained happy with Karen. He was soon called back into action when he was kidnapped along with Judge Lewis for a mock trial held by the Owl. As the battle against the Owl continued, Daredevil saved Judge Lewis from the exploding robot owl that they escaped on but was unable to save the Owl. With the death of the Owl, Matt decided to publicy reveal his identity as Daredevil and retire from superheroics, instead focusing on running for the office of district attorney. He and Karen were soon wed and Matt won the election in a landslide victory. Daredevil originally had the same superhumanly accurate senses (except sight) that his Earth-616 counterpart had but he lost all of his powers after being exposed to an atomic pile. He did regain his gain though, through an experiment procedure by Dr. Van Eyck. Max Dillon was the same as his Earth-616 counterpart up until he discovered that Daredevil was blind during a battle with him. After being arrested, Electro revealed the information to the press. Electro had the same electricity-manipulating abilities that his Earth-616 counterpart had. Higgins was a police officer who was called to the law offices of Murdock and Nelson during a battle between the Owl and Daredevil. Higgins was shocked to find only Daredevil on the scene as the Owl had escaped moments before Higgins arrived. 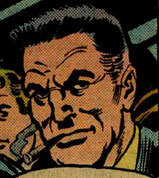 J. Jonah Jameson was the same as his Earth-616 counterpart up until Daredevil's blindness was revealed by Electro. After nursing a hatred for Spider-Man by sending a robot after him, Jameson went on television denouncing Daredevil as nothing but a black mark against all handicapped individuals. He later appeared with Peter Parker at a press conference held by Daredevil where Daredevil revealed his true identity and ambitions to run for district attorney. Duke Kruger was a former classmate of Matt Murdock's who ruled the country of Lichtenbad with an iron fist. When Kruger had Dr. Van Eyck captured for speaking against him, Daredevil confronted the Duke in battle. During the battle, Kruger activated a device that would cover the Earth in a radioactive cobalt cloud. Daredevil quickly knocked Kruger out and disarmed the device, exposing himself to high levels of radiation that cost him his superpowers. Judge Lewis was the judge who had sentenced the Owl to prison. After the Owl's breakout, the Owl had his men kidnap Judge Lewis and Matt Murdock in order to hold a mock trial for the crimes of sentencing the Owl to prison. The Owl ordered Judge Lewis put to death but the non-powered Murdock changed into his Daredevil outfit and saved the Judge, escaping the Owl's volcanic base atop the Owl's robotic owl. When the robot exploded, Daredevil managed to save Lewis but was unable to save the Owl himself. Foggy Nelson was the same as his Earth-616 counterpart up until he witnessed Karen Page kissing Daredevil. Thinking that he could never compete with a superhero, Nelson became somewhat withdrawn and depressed. Much later, when Matt Murdock revealed his identity and aspirations for the seat of district attorney, Foggy walked away teary-eyed, thinking that Page would never be his nor would he ever get the seat of district attorney for himself now. Despite his setbacks, Foggy thought to himself that he would never desert his friends. The Owl was essentially the same as his Earth-616 counterpart up until he discovered from the news that Daredevil was blind. Seeking a lawyer to represent himself, the Owl attacked the law offices of Murdock and Nelson, attracting the attention of Daredevil. Using amplified owl hoots and smells, the Owl disoriented Daredevil's super senses enough to escape the law offices when the police arrived. He was soon tried and sent to prison but managed to escape. For revenge, he kidnapped Matt Murdock as representation for Judge Lewis, the man who put him behind bars. During the course of the battle, the Owl was killed when his own robot owl exploded and the recently depowered Daredevil could not save him in time. Karen Page was the same as her Earth-616 counterpart up until she deduced Daredevil's true identity. She soon managed to talk Matt Murdock into having his eyesight restored by Dr. Van Eyck and was happy to share a life with Matt Murdock. When Matt eventually publicy revealed his identity and ran for district attorney, Karen and Matt were married. Peter Parker was the same as his Earth-616 counterpart up until he came to aid Daredevil against Electro while on the run from a robot sent after him by J. Jonah Jameson. During the battle, Spider-Man discovered that Daredevil was blind but remained a good friend to the hero. As Peter Parker, he later attended the press conference where Matt Murdock revealed his dual identity and aspirations for district attorney. Once Matt had been married and became D. A., Spider-Man swung by and asked how Matt was doing, claiming that he'd always be a hero in his book. Spider-Man had the same superhuman strength, agility, and spider-sense that his Earth-616 counterpart had. Doctor Van Eyck was a doctor who had developed an experimental procedure of restoring the eyesight to those rendered blind. He came to Boston briefly before returning to Lichtenbad where Matt Murdock visited him and asked to be given the treatment. After restoring Matt's eyesight, Van Eyck deduced his true identity as Daredevil and suggested that Matt notify the U. S. embassy of Lichtenbad's tyrant Duke Klaus Kruger. For his "treason," Van Eyck was captured but Daredevil came to his rescue. When Kruger activated a device that would cover the Earth in radioactive cobalt, Van Eyck attempted to deactivate the device but Daredevil pushed him out of the way and stopped it himself, receiving a high dose of radiation. As he recovered, Matt Murdock realized that his superhuman powers were gone and Van Eyck commented that while Matt saved the world, he had also robbed the world of a heroic champion.